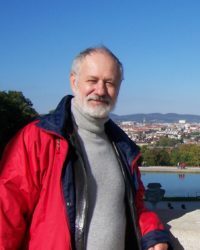 Victor A. Shnirelman, doctor in history, is a senior researcher at the Institute of Ethnology and Anthropology at the Russian Academy of Sciences in Moscow. His scholarly field is cultural anthropology. His research interests include nationalism, racism, ethnic conflicts, neo-paganism, cultural memory, politics of the past in the Soviet and post-Soviet world, eschatology, and theories of conspiracy. He has authored more than 470 scholarly publications, including more than thirty books. Tri mifa o zagovore: antisemitskaia propaganda v sovremennoi Rossii (Three Myths about a Plot: Anti-Semitic Propaganda in Contemporary Russia). (Moscow: Academia, 2017). “The End of the World and the Jews in the Russian Orthodox View.” A Universal Imagination of the End of the World?, edited by Frédéric Le Blay. From Imagination to Contemporary Issues, vol. 1, Cambridge Scholars, 2018, pp. 68–84.